To prepare the teeth for the veneers, the teeth are lightly buffed to allow for the small added thickness of the veneer. Usually, about half a millimeter of the tooth is removed, which may require a local anesthetic. 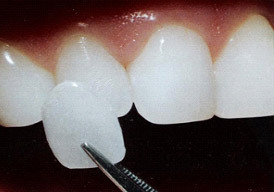 Composite resin veneers are generally done in one appointment. After the tooth is prepared, our dentists will carefully bond and sculpt the composite material onto your teeth. For ceramic veneers, a mold is taken of the teeth, which is sent to the laboratory for the fabrication of the veneers. This may take several days. If the teeth are too unsightly, a temporary veneer can be placed, at an additional cost. When your ceramic veneers are ready, Gauthier, Marchand, or Mahibir will place the veneer or veneers on the teeth to check its fit and to get a sense of the shade or color. While the veneers are resting on your teeth, view the results, and pay particular attention to the color. At this point, the color of the veneers can still be adjusted with the shade of the cement to be used. 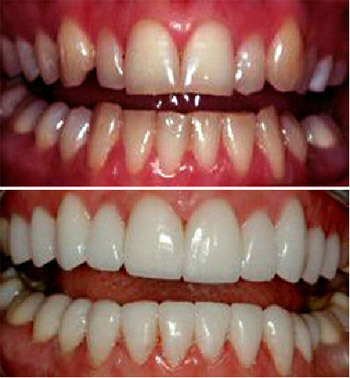 The color cannot be altered after veneers are cemented. To apply the veneer, the tooth is cleansed with specific chemicals to achieve a bond. Once the special cement is sandwiched between the veneer and tooth, a light beam hardens the cement. This procedure can greatly enhance your smile and can increase your self-esteem and confidence. In many situations, veneers are an excellent alternative to crowns because they provide a much more conservative approach to changing a tooth’s color, size or shape. Veneers can mask undesirable defects, such as teeth stained by tetracycline and damage due to an injury or as a result of a root-canal procedure and they are ideal for masking discolored fillings in front teeth. People who have gaps between their front teeth or have teeth that are chipped or worn often consider veneers. Generally, veneers will last for many years, and due to Qualident’s remarkable success with veneer procedures, patients have experience longevity thus, call us today for your FREE consultation at 622-3777. Porcelain veneers solve the same types of problems as bonding – chips, gaps, stains, discolorations, and crooked teeth; however, the veneers have the additional advantage of strength and support. Veneers are relatively more desirable and are much more durable than bonding, however need the same care and maintenance as your natural teeth. If very dark stains need to be masked or if existing porcelain crowns need to be matched, porcelain veneers may be the treatment of choice. Porcelain veneers require more than one visit to our office because of the laboratory work involved. Minimal shaping is required to create space for the veneer. There is usually a space between appointments. Between visits, the patient wears provisional veneers, a kind of smile sculpture which allows us to choose the final result. The fee for porcelain veneers varies according to the choice of work desired. At Quali-Dent, we welcome the opportunity to discuss the many options available in delivering an individualized smile so please call us today at 622-3777 for your consultation.